If community service were a gene, Terri inherited it. Because it’s in her blood, passed down from generations before her who had an unrelenting need to give to others. Like the time her grandparents orchestrated a church raising in their neighborhood when their community desperately needed one. And, then, after that church burned in a fire, when her father mobilized the community to rebuild it. Her childhood home became a respite for traveling priests, with Terri’s parents welcoming them in with a spirit of hospitality and kindness. Her mother serves as a member of the Parish Council today. But Terri’s love of service isn’t something she just passively inherited. It’s active in the fabric of everything she sets out to do. Her love of service has produced a life of accomplishments bigger than her – those that have helped shatter stereotypes, shake up institutions and change the course of human lives. 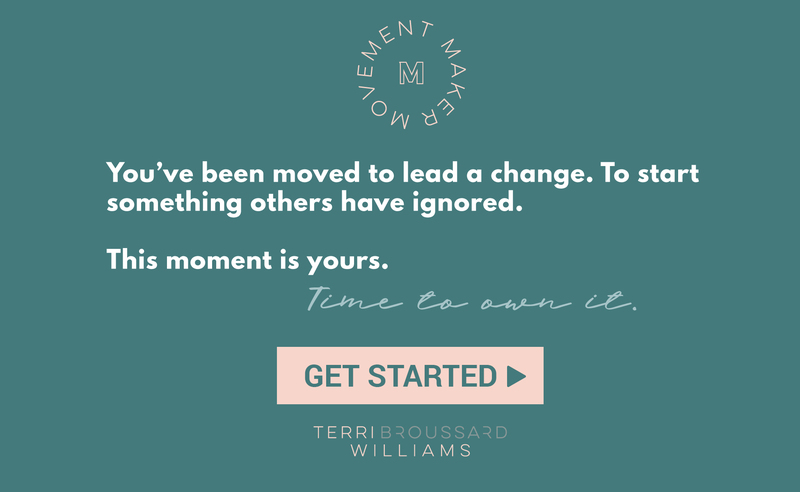 Terri believes leaders turn moments into movements. In less than four decades on earth, Terri counts the following moments as movements that she’s been a part of, championed or accepted as her own. Each has defined her as a leader. On election night while running for student government at LSU, it was determined that Terri lost by less than 10 votes. Despite her loss, the student government asked her if she would like to be appointed to a special counsel. Terri had a choice – be proud and say no, or take on the position, even though she had been burned. She came to the realization – the choice was bigger than her. She had an opportunity to be a role model, and chip away at the stigma that African Americans didn’t get involved on campus. Terri said yes to the position, and yes to leading by example. Terri’s broadcast journalism and campaign manager background alone would have made her unique at the state capital. But Terri was also a minority. And a woman. And at the age of 25. Together, her collective qualities made her an anomaly. When a lobbyist position became available with the American Heart Association, the organization already had a list of potential candidates. Terri wasn’t listed. Working her connections and her charm, Terri got an interview that escalated her to becoming one of two candidates. Then, the call came that she didn’t get the position. Ever so coolly, in that moment, Terri said she would be a resource for the organization, and that she had a feeling she would work with them someday. Her confidence paid off and a few months later, the candidate she competed against had resigned. In her first year, she received the highest national honor that could be bestowed on an AHA employee – the Rome Betts-Honorable Mention award. Years later, she outright won the award. Accepting the position at American Heart Association was the beginning of many future movements for Terri, helping to pass laws that most thought could never be done. After Hurricane Katrina, many at the Louisiana State Capitol said it would be impossible to push any non-hurricane legislation. Terri didn’t listen. Lobbying to pass a major no-smoking bill that would restrict smoking in public places like restaurants, Terri worked around the clock to get the support she needed from lawmakers. She built coalitions of support. She pushed back on proposed amendments that didn’t fit the spirit of the bill. She continued to fight even as others’ support waned. With persistence and a little bit of faith, the then 28-year-old watched The Louisiana Smoke-Free Air Act pass, one of the biggest defining moments in her career. Now, Terri is focused on paying it forward – encouraging and building up others who want to make their own movements. Ready to start a fire or inspire a movement? An advocate of servant leadership, I believe social enterprises are change agents for causes. I can teach you how to incorporate philanthropic initiatives to help support the change. As a lobbyist who’s seen the power that policy changes can have in a movement, I can teach you how to receive momentum and policymakers’ attention for your movement.